Hey guys, well here we have it! The tracks that look to make up BODY COMBAT 39. Some of the tracks are not a surprise at all (So What as a track 6 was a given obviously!) – Rogue Traders as lower body warmup – we’ve been there recently, as with Nick Skitz for the Muay Thai. Anyway, enough from me – here’s the list (and all the youtube links I could find – note that the exact mixes of each track itself used in the actual release may differ from the mix but you’ll get the idea). Let me know your thoughts… Enjoy!!! Picture yourself fighting one-on-one in the cage – Ultimate Fighting Championship (UFC) style – and that’s BODYCOMBAT™ 39. You’re going to learn the skills you need to hang on until the last round so get ready for some combo-heavy tracks and lots of repetition. To get a taste of an authentic UFC you’re going to need to get warmer faster as ultimate fighters are among some of the fittest athletes in the world. So that’s what the Warmup is all about, with a focus on keeping light on your feet. Get ready for one of the longest combos ever seen in a Power Training Track in Track 3 – can you believe there are 16 Punches in a row? The power for the huge combo comes from the core of your body and motivation from rocking track Come With Me. Two different types of energy are needed in Track 4. The Knee Combo is fun and light but you’ve gotta be tough during the Back Fist/Side Combo. Scooter vs. Status Quo’s Jump That Rock (Whatever You Want) harnesses the energy perfectly. There are six solid rounds of identical choreography in Track 5 which also features the Power Squat. P!nk’s in the house in Track 6 and you’re gonna want to start a fight during So What. There’s no recovery and you’re trying to knock your opponent out with every punch! A new move, the Step Over Cross, features in Track 7. This is awesome as it can be used in both an offensive and a counter-move situation. Make sure you hold something back for the last 60 seconds of continuous Knee Strikes! Your muscular endurance is certainly tested in Track 8 where the challenge is to never step out of the intensity. Track 9 is void of conventional Situps and instead uses the Hover and Side Plank to work all of the core muscles. The apt lyrics of Infernal’s I Won’t Be Crying help you through this intense track – even though you might feel like crying by this stage! The theme for BODY COMBAT 39 is cage fighting (Ultimate Fighting Championship). The stage was decked out as a cage, and Dan, Rach and the other two presenters (whose names I’ve forgotten too sorry!) Tony from Brazil and Vanessa from Portugal (thanks Bevan and Raina for that info! 😀 ) were all wearing gear with a ‘cage pattern’ on it. Looked pretty awesome actually! All for were tanned and in absolutely awesome shape. The one thing I’ll say about this release is that they have kept it REALLY simple. There’s no ginga, no esquiva, no e-kick, no jump knees – it’s all really really simple chorry (and sometimes really repetitive). Track 4 does have the jump kick, but that’s the only “advanced” move in the entire release. The real stand out tracks for me were track 6, and track 7. Track 6 (So What by Pink) had simple but effective chorry – double uppers, hook-hook, back kick, double knee, front kick. I found myself getting into a really good rhythm coming from the back kick into the knees and really enjoyed this track. The fact I love the song helped! Rach presented this and she was able to really build the levels and hit the peak with heaps of attitude “we’re all gonna get in a fight!”. 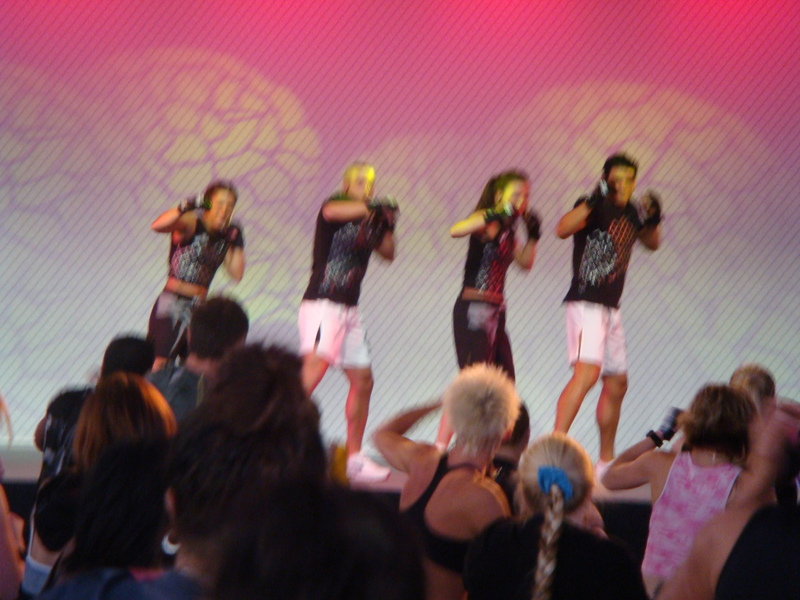 Track 7 (Muay Thai) was awesome too. A tonne of knees… and I really mean a TONNE of knees, and just when you thought the track was over it wasn’t and continued with another massive burst of knees. I mentioned that the chorry in this release is simple, and it really is. That can be good as it makes the entry into BC easier for people trying it for the first time. I’m sure there have been times when new participants have tried to emulate an instructor doing jumping evasive side kicks on their first class and maybe gotten a little freaked out! Nice thing about this (and quite a few of the recent releases actually) is that newbies can quite easily follow the moves almost immediately without too much of a worry. The downside is simple movements can get a little boring for the diehard experienced combatters. The power training tracks in particular were pretty repetitive I thought. One of them (I’m pretty sure it was track 3) had the same sequence repeated 6 times throughout the track… of course I enjoyed it last night but I did worry that perhaps the novelty could wear off? Time will tell of course. One other interesting point was that there was no crunches nor sit ups in this release. Not-a-one! Instead we had the plank (or hover as you may call it)… and that’s it for abs! I know! A lot of them – both front and side. It was kinda cool for a change and the great thing is the transition from a plank into a press up is of course seamless. All in all I really enjoyed the release. And I enjoyed all of the music – a really consistent hard workout with no lulls – I think it’ll be great for bringing new people into the programme too. Of course having only done it once my opinion will no doubt change after the official release – but IMO this is definitely a release to look forward to!!! BODYCOMBAT 39 filming - knees! Pink’s ‘So What’ in Body Combat 39 – bets anyone? 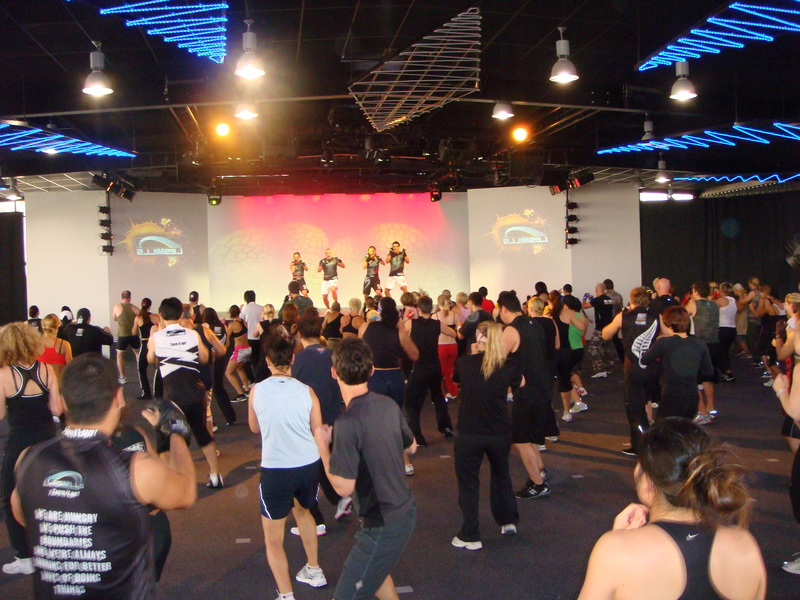 UPDATE 31 October 2008: Latest word is So What is also in BODYPUMP 69 – yay!! !